Terry has had it with winter, so he decided to go for a road ride on Sunday. He asked his wife’s permission, because that is what we do when we want to stay married. 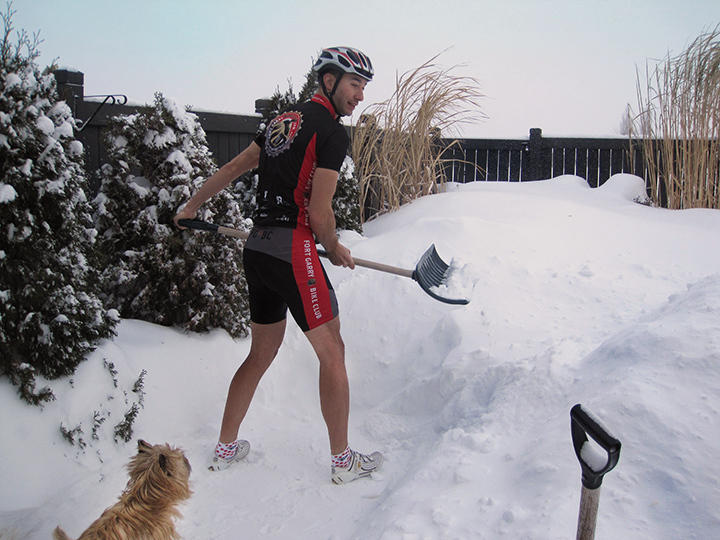 She told him he could go, but only after he finished the shovelling. Poor Terry. This photo could be in one of those Italian cycling calendars with models who have no business wearing Liquigas skinsuits doing totally natural things like washing bikes beside the team bus. I have considered doing a calendar featuring this picture for all twelve months. A summer photo wearing same kit mowing the lawn. Maybe one ice fishing, I leave halloween and Easter up to your imagination.